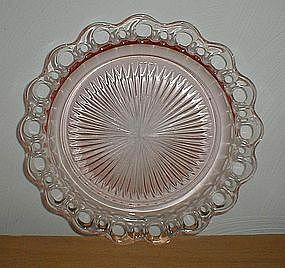 Pink Old Colony, Lace Edge, Open Lace, 10 1/2" Dinner Plate in excellent condition. No damage, none of the "usual" lace nicks and hairlines. 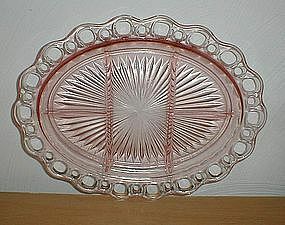 Pink Old Colony, Lace Edge, Open Lace 12 3/4", 5 part Platter in excellent condition. No damage and none of the "usual" lace nicks and hairlines. 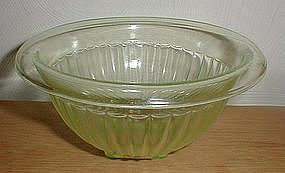 Green Paneled 6 3/4" Mixing Bowl in very good condition. No nicks, chips or cracks. A few light rub/use marks. 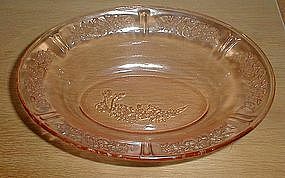 Pink Sharon Oval Vegetable Bowls in excellent/mint condition with no damage or use marks. $25.00 for one or $45 for both. Two are available. 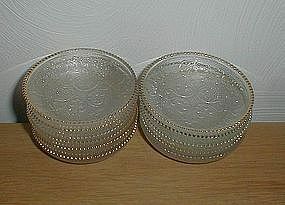 Two pink Old Colony - Lace Edge, 6 3/8" Cereal Bowls, both in excellent condition with no damage. including lace edge nicks or cracks. $15 for one or $25 for both. 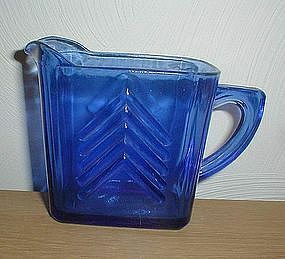 Cobalt Chevron milk pitcher, by Hazel Atlas. Excellent condition with no damage. 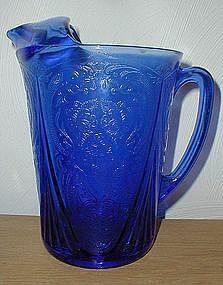 Cobalt Royal Lace 48 oz. straight side pitcher in excellent condition with no damage. Cobalt Royal Lace 3 1/2", 5 oz. Juice Tumblers in excellent condition with no damage. 8 are available. $45.00 for one, $40.00 each on orders of two or more. 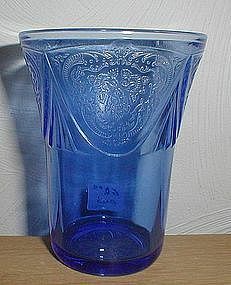 Cobalt Royal Lace 4 1/8", 9 oz. 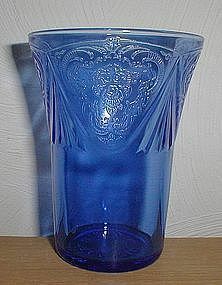 Tumblers in excellent condition with no damage. 7 are available. $30.00 for one or $55.00 for two. 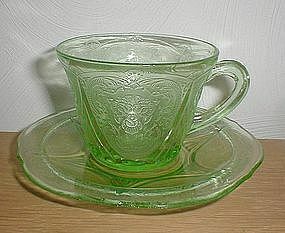 Two sets of green Royal Lace Cups & Saucers, both in excellent condition with no damage. 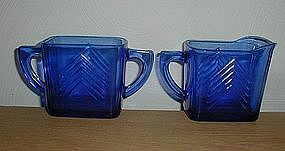 Cobalt Chevron Cream & Sugar, both pieces in excellent condition with no damage. 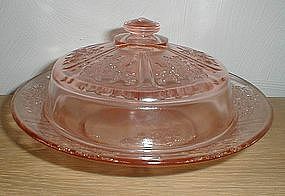 Pink Sharon Butter Dish. Top & bottom, both in excellent/mint condition. This has been carefully checked and it's NOT a repro. 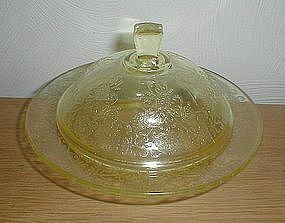 Yellow Florentine #2 Butter Dish in almost excellent/mint condition. No damage or use marks on either the top or bottom. Sapphire Bubble Cups and Saucers, all in excellent condition with no damage. 3 cups & 6 saucers are available. 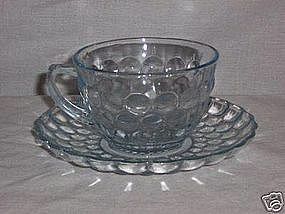 $5 per set for cup & saucer. $2 each for the extra saucers. Fire King Charm azurite Saucers in excellent condition with no damage. 8 are available. 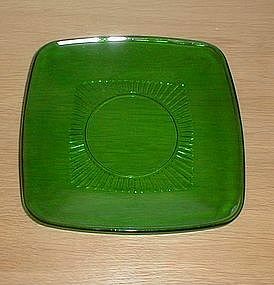 Forest Green Charm 6 3/4" Salad Plates in very good condition. A few very small and light use marks. No nicks, chips or cracks. 2 are available. Forest Green 36 oz. (actual 38 oz. 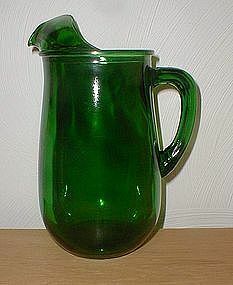 to the tip top) Pitcher in excellent condition with no damage. Harp gold edged Coasters. 7 are available. Some have decent/hardly worn edging, some have a lot of wear to the edging. $4 each for the decent ones. $2.50 each for the worn ones.